Epithelial necrosis-shrunken keratinocytes with hypereosinophilic cytoplasm and condensed nuclei (arrows) in a male F344/N rat from a 90-day study. Epithelial necrosis-shrunken keratinocytes with hypereosinophilic cytoplasm (arrows) in a male F344/N rat from a 90-day study. Epithelial necrosis in a male F344/N rat from a 90-day study-in severe cases, necrosis of the epithelium may extend into the hair follicles. Skin necrosis-transmural necrosis of the epidermis, dermis, and subcutis in a male B6C3F1 mouse from a 90-day study. 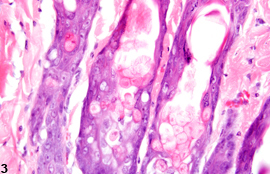 The initial response to a toxic agent in dermal toxicity studies usually involves some degree of epithelial cell damage or destruction, such as degeneration or necrosis. 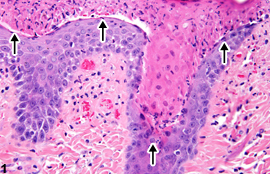 Epithelial necrosis ( Figure 1 and Figure 2 ) as a primary lesion is less frequently reported than ulceration in NTP studies. 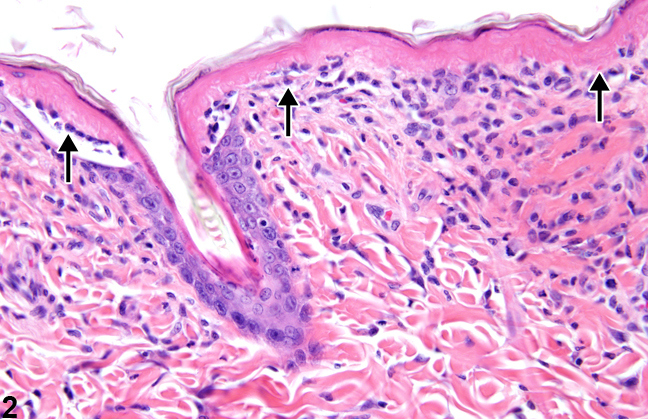 In severe cases, necrosis of the epithelium may extend into the hair follicles ( Figure 3 and Figure 4 ). 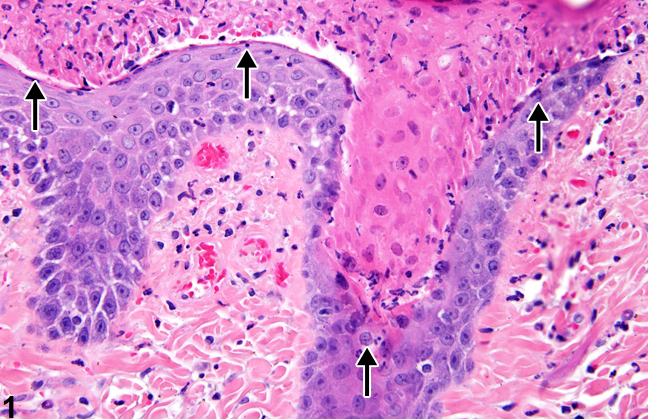 Epithelial necrosis and follicular necrosis are characterized by shrunken or swollen keratinocytes with hypereosinophilic to hyalinized cytoplasm and condensed nuclei with varying degrees of pyknosis, karyolysis, and karyorrhexis. 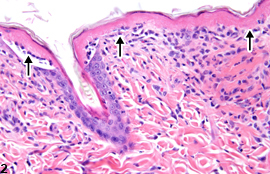 Skin necrosis ( Figure 5 and Figure 6 ) is characterized by transmural necrosis affecting the epidermis, dermis, and possibly the subcutis. It is infrequently diagnosed as a primary lesion. Necrosis most commonly occurs secondary to damage of the epidermis and frequently extends into the dermis and subcutis. Necrosis extending into the subcutis is not to be confused with fat necrosis, which is limited to the subcutis and occurs sporadically as a background lesion in the subcutaneous tissue of the abdomen in mice and rats. 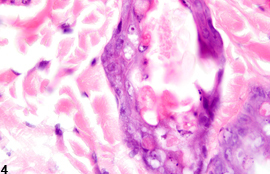 Dystrophic mineralization is commonly seen as a component of skin necrosis. Metastatic mineralization is not associated with necrosis or inflammation but due to calcium:phosphorus imbalance. 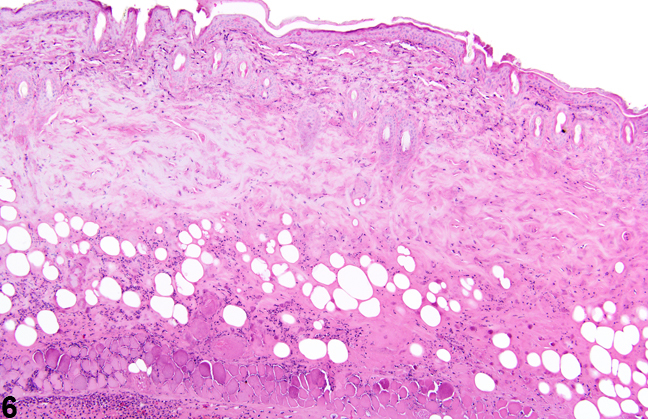 When observed, epithelial necrosis should be diagnosed and assigned a severity grade. 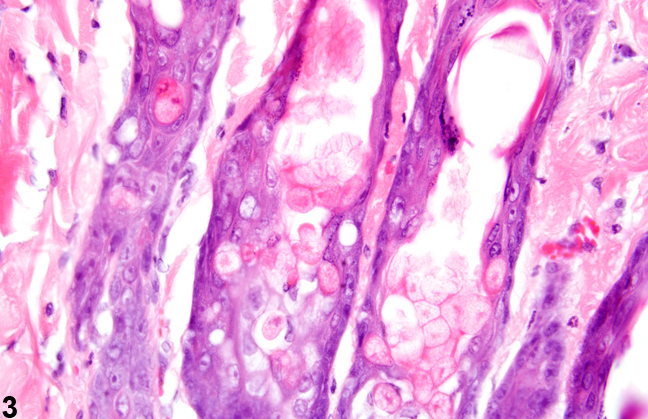 In more severe cases, the follicular epithelium may also be necrotic; this should be reflected in the severity grade assigned to epithelial necrosis and described in the pathology narrative. 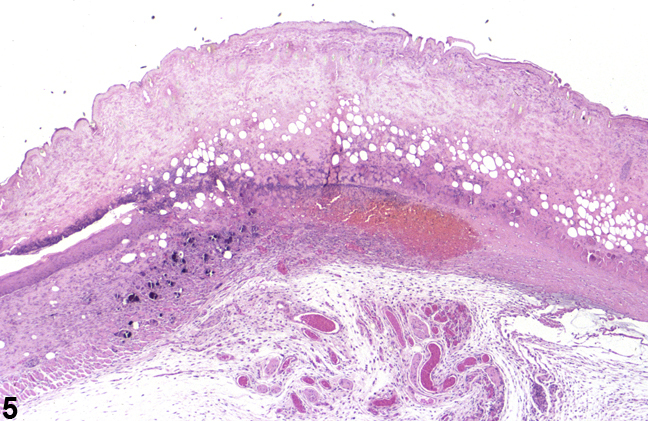 If follicular necrosis occurs without epidermal involvement, the term “Skin, Hair follicle – Necrosis” should be used. Associated lesions, such as inflammation and ulceration, should be diagnosed separately.